PACIFIC AND COOPER STREETS. We can still appreciate the County Bank Building and the I.D Bank Building. 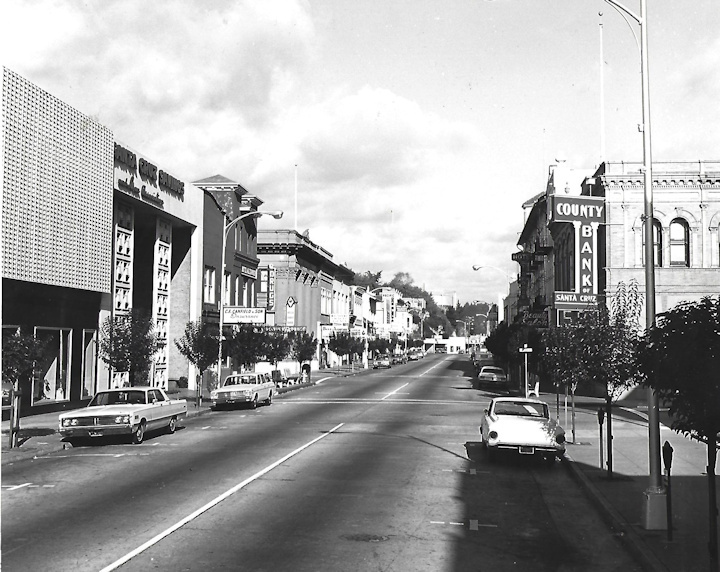 Now we see Regal Cinema, Palace Stationers, Peets Coffee, and The Sock Shop. I still don’t have a year for this photo. Can any car enthusiast clue me/us in? WHEN A PIANO CONCERT GOES OFF KEY! The most unusual musical instruments of the world! PROBABLY ONLY IN SANTA CRUZ. There was so much well-deserved anguish, chest-beating, anger, sympathy and plain frustration over the evil voting restrictions that cost so many citizens their voting rights two weeks ago. Now in Santa Cruz we’re having to live with the gripes of how same-day registration and voting made it too easy to vote! We can only guess where those complaints are coming from. ERRETT CIRCLE-CIRCLE CHURCH DEVELOPMENT NEWS! Rumors have been rife for a few years now about who’s going to develop the Circle Church land. Now we know. A public notice of a “Community Outreach Meeting for proposed development” was sent out last week. On Thursday November 29 at 7 p.m. in the Church’s Sanctuary Room, the Circle of Friends LLC Co-Housing group will present two options. The first is to build 12 single family lots there. We can bet those “family lots” will run in the millions. The second option is 10 family lots and a cluster of small townhouses — ie. 4 two bedroom homes, 2 one bedroom homes and 4 accessory dwelling units (ADU’s). The notice says that the City Planning Department prefers the second option. Check out the history of the Circles here http://www.mobileranger.com/santacruz/santa-cruzs-westside-going-in-circles-since-1890 . This will be a never-to-be forgotten test of the power of citizens, neighbors, and everyone who cares about the environment, history, tradition fighting against the City Planning Department. It’ll also test our City government, and show us where their loyalty, community spirit, and plans for the future truly are. Everyone who cares about this significant part of our city should be at that meeting this next Thursday. SQUARING THE CIRCLE (CHURCH). A long time and trusted friend sent this…“Circular rumors have it that no permits have been issued, or even applied for, for development of the “Circle Church”. As of this week one of the owners Chris Drury the former pastor of the Circle Church is living in a mobile home on the premises. I believe London Nelson is so heavily booked that it’s almost impossible to rent space there. I’m wondering if there is any interest amongst the city council to purchase this property as a rented community center? Can this subject be up for public hearing/vote? I’m hearing that the entire structure may be demolished for so called co-housing. Very disturbing. Think we can start some movement in the city to have council purchase? I know it’s probably a long shot, but may be worth some effort.Of course you’ve heard about the same Chris Drury, now with a name change…hmmmmm, is leasing the former Logo’s to open another alcohol outlet called “faith on tap”. Another scam by this scumbag”. Barring any last minute surprises, it appears that Justin Cummings and Drew Glover will join sitting council members Sandy Brown and Chris Krohn to form a new city council majority with a distinctly different philosophy from the current majority of Noroyan, Terrazas, Mathews, Watkins and Chase. That incumbent Noroyan failed to secure enough votes for a second council term indicates that the community is ready for a change. I’ve been actively involved in city politics since the early days when Mike Rotkin and Bruce Van Allen successfully challenged the business/development council majority with what at the time was a new electoral strategy (campaign managers, direct mailers, walking precincts, get out the vote, door-hangers etc). For a while it seemed that neighborhood groups would have a voice as powerful as the business interests that had dominated city politics for decades. There were earlier council members who broke up the “good old boy” network. In the 1970’s, Virginia Sharp, Sally DiGirolamo and Bert Muhly brought environmental issues, neighborhood protection and historic preservation to the fore and were joined later by Carole DePalma, a strong voice for the environment, neighborhood protection and the main architect of our Heritage Tree Ordinance. Together with Gary Patton on the Board of Supervisors, followed by Mardi Wormhoudt, supported and motivated by a community of environmental activists, ordinances were passed to limit growth to a sustainable level, greenbelts obtained, massive developments halted, civic participation encouraged and for a while it seemed that Santa Cruz might really be a beacon of progressive thought and action. Since that time, UCSC has grown from 5 to 19 thousand students, fuelling an affordable housing crisis. Via the Internet and slick marketing, Santa Cruz is now a year-round destination for global tourists. The push for economic development as an inherent good now holds sway over sustainable growth. Top city department heads are hired with the same pro-growth philosophy. Developers are granted immunity from providing even a gesture of below market rate housing. Our greenbelts are under threat as newbie mountain bike orgs push for greater access for their sport that not only damages the land but drives out passive uses such as walking and birding, all the while sneering at the aging environmental activists who saved these lands in the first place. Even our historical municipal wharf was put on the chopping block for monetary gain. Talk about time for a change! I, and other die-hard neighborhood and environmental activists probably go to more city council meetings than most. We speak for our allotted two minutes (itself an erosion of public participation) then sit watching as the council majority ignores our input and consistently votes in favor of development. Not one of them has voted to save a heritage tree. Out of scale developments are never challenged. The impact of such developments on established neighborhoods never addressed. They rarely if ever challenge the recommendations of department heads. They seem more concerned about the needs of those who don’t yet live here but want to, as they smooth the way for the newcomers’ arrival. Since the new council will not be seated until after the next council meeting there is unfortunately time for more damage from the current council majority. Put on a fast track by city planning staff, changes to the Accessory Dwelling Ordinance will have been voted on (November 27th meeting) by the time you are reading this. I have written at length on the negative impact of the proposed changes. Removing parking requirements; increasing size; reducing setbacks and the real slap in the face to neighborhood stability, changing the owner-occupancy requirements. In a town where absentee landlords hold 56% of the town’s housing stock, they have no incentive to temper the impact of two dwellings filled with partying students as they would if they lived in one of the dwellings. Staff well understood that a new council majority might not be enthusiastic about rezoning single- family neighborhoods into student dorms, hence the rush. After that, the hope and expectation is that with a new majority cut from a different cloth, we will once again have decision makers who care more about those who live and work here, particularly the lower income and most vulnerable, than those who want to profit from over development and growth. That protecting our environment will mean more than a paragraph in a campaign brochure. That attracting tourists and ignoring residents is not the order of the day. That perhaps a beautiful heritage tree can be protected. That public participation is encouraged and welcomed at council meetings rather than endured. And as always, no council member can be successful without an active, engaged public. That’s our job. It was a consequential campaign. From the very start back in February, many long-time observers of the Santa Cruz City Council were aware that the 2018 election might be a memorable one. With the state of national affairs what they were–Trumpism, Kavanaugh, and McConnell, (oh my! )–many locals who wished for better outcomes were ready to invest time and energy into local politics. After all, a severe housing crisis was helping fuel an even more severe homeless crisis and not getting involved was not an option. Although Measure M, which called for rent control, was a ballot initiative for the ages–providing iron-clad support for tenants, first–the Santa Cruz city council majority was also at stake. The council was experiencing a five-member, 12-year market-rate development-first ethos. It was a well-oiled vice grip manufactured by those with great means, and it resulted in that majority often turning a deaf ear to various segments of our community. Whether it was the hundreds who came out to council meetings in 2015 to protest the acquisition by the police of a Lenco BearCat Tank offered by the Department of Homeland Security, or protesters who railed against the non-acquisition of the Beach Flats Community Garden, there was a stark portrayal that things were not well in Surf City. Then, the community pushback on two projects at either end of Pacific Avenue comprising over 150 condos with little affordability seemed to go almost unnoticed by the developer class. (And now along comes Devcon’s 206-market rate apartment complex…stay tuned.) Earlier (2016) a former church site property, zoned for multi-family housing, was transformed into a play palace for the well-heeled traveler, now known as the Broadway Hyatt. The current city council majority had also registered yays in the face of Westside neighborhood opposition in order to place a garish hotel on Mission near Swift Street without implementing any neighborhood suggestions; a cell tower on Meder Street was approved in the face of 20 neighbors present in council chambers; and Jump Bike racks were put in places they simply should not be. Combine that with an eastside uprising over all the council yes votes for market rate housing along the “corridors,” which produced few affordable units and set the stage for a robust and rigorous council campaign of issues over platitudes and hoped for leadership over policy rubber stamping. The campaign was informative and heated. It was about “housing, housing, housing.” Rent control was the obvious wedge issue, but the library-at-the-bottom-of-a-five-story-garage-on-top-of-the-Farmer’s Market was also center-stage. A 25% inclusionary ordinance to help yield more affordable rentals was suggested as was offering tenants priority over the university-inspired rental inspection ordinance. The current SC city council “winners” appear to be Justin Cummings, Donna Meyers, and Drew Glover should the current trend of voting returns continue until 12/6. The Good Times last week said that this candidate formation would likely hold. The Santa Cruz Sentinel also seemed to suggest the same this past Monday morning and three new faces would indeed appear soon at city hall. But ultimately it is the County Clerk, Gail Pellerin who will issue a final ballot summary and report. The Santa Cruz City Council will likely rubber stamp that count at its Dec. 11th meeting and then it will become real and a key historical moment all in the same time. 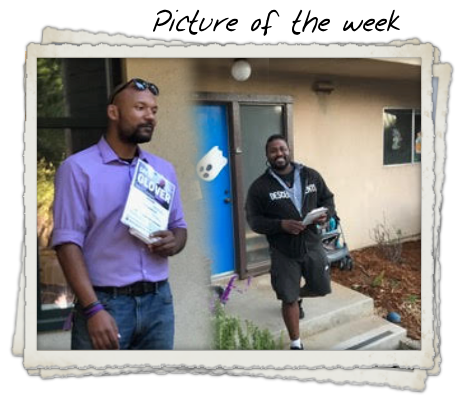 As I said here last week, the people who supported Justin, Drew, and Measure M worked hard, overcame the moneyed interests, and should be proud of their work no matter the outcome, although cleaning up yard signs, paying off any last-minute loans, and cleaning up the campaign office is much easier when you win. Soon, it will be on to the process of healing some of our community’s open political wounds. I look forward to participating with the next city council in that process. Two great candidates, tenacious campaigners, and good people. My daughter Isabel was born 18 years ago this week and watching her grow and change, and change again has been one of the true joys of my life. Thank you, Supervisor John Leopold for being the lone “NO” vote on last Tuesday’s Board of Supervisor meeting when the County Zoning Code changes got approved to create extremely dense and tall development, possibly outside of the Urban Services Line, completely change the quality of life for rural and semi-rural neighborhoods. The Public Hearing was well-attended by developers and others who will profit by these changes and inherent concessions, but only two or three members of the general public could take time off work to be present and testify. I have heard the Planning Department staff presentation on this topic a few times, going before the County Housing Advisory Commission and the Planning Commission. Previous photos of large developments in other counties were exchanged for photos of quadruplexes in Santa Cruz City, but still did not include local affordable housing projects such as Aptos Blue or Canterbury Commons in Aptos. Last Tuesday’s presentation omitted discussion of the developer incentives that will allow deferred payment of impact fees (money that funds infrastructure needs to handle impacts of the development) and building height and setback variances. It will allow Ad Hoc planning policy that will allow developers to apply for extra-dense R-Combining Districts (30 units/acre) anywhere in the County to be approved by the Board of Supervisors without regard to infrastructure to support it. It will grant developers major concessions allowed under Planned Unit Developments (PUD) yet not necessarily require the affordable units for which the concessions would be granted to actually all be built. Supervisor Ryan Coonerty immediately made a motion to approve all proposed changes without the benefit of discussion by other Board members first. Supervisor John Leopold asked if Mr. Coonerty would consider an amendment to his motion to include a requirement that such proposed dense development be limited to within 200′ of major transportation corridors? “NO” said Coonerty. Supervisor Leopold said “I am not sure this gets us to our primary goal of increasing affordable housing in Santa Cruz County. This will not generate that much more, and the rest will not be affordable by design. Projects with 100% affordable housing make sense for these types of bonus incentives. IS THIS GOOD LAND USE PLANNING? WHAT WILL OUR COMMUNITY LOOK LIKE? We need to do this in concert with the Sustainable Santa Cruz County Plan to locate these developments along transportation corridors. When the County required inclusionary 15% affordable units of developers, there were 500 units built.” He further discussed the need to follow the Sustainable Santa Cruz County Plan, formed with public input (a bit rhetorical if you consider the Nissan car dealership debacle on 41st Avenue), but got no support for this action from other Supervisors. Supervisor Greg Caput kept repeating that there is a crisis but wondered what the impacts of such dense development might be on public infrastructure. “Are we looking at that?” he asked, noting there is nothing zoned for parks near dense developments. “We’re in a crisis but we don’t want to run off and build without thinking about it.” Oddly, he announced that he supported the proposed changes. Supervisor Bruce McPherson also referred to the “Crisis”, but assured (maybe himself) “We’ll keep working on the Sustainable Santa Cruz County Plan, but let’s go with this. I am happy to see such diverse stakeholders in support.” Indeed, a diverse group of people who will profit were in support of the approvals. Chairman Zach Friend glibly said “It is easy to create fear and be against change. These are tired arguments that have been used for 30 years.” What does this carpetbagger know? Contact your County Supervisor and ask for a public meeting to have these changes explained and discussed during an evening meeting, or attend constituent hours for any and all Supervisors. We have just been sold out for developer profits, and will get very little affordable housing in exchange. In my opinion, THAT is a crisis. View documents and watch the proceedings for Item #7 at the November 20, 2018 Public Hearing here. Supervisor Ryan Coonerty ryan.coonerty@santacruzcounty.us No office hours. Supervisor Zach Friend zach.friend@santacruzcounty.us 4th Thurs. (9-10am) at South County Sheriff Center (790 Green Valley Rd., Watsonville), 3rd Wed. (9-10am) Corralitos Fire Station, with staff available most Wednesdays (9-10am) at Community Foundation Bldg in Aptos and 4th Thurs. (10:30-11:30am) at La Selva Beach Library. Supervisor John Leopold john.leopold@santacruzcounty.us First Wed. (5:30-6:30pm) Porter Memorial Library, 2nd Wed.(5:30-6:30pm) Summit Elementary School, 3rd Wed. (5:30-6:30pm) People’s Coffee at 17th Ave./ Brommer. Supervisor Bruce McPherson bruce.mcpherson@santacruzcounty.us Wed.,December 5 (12:15-1:30pm) Felton Sheriff Center and Wed., December 19 (12:15-1:30pm) Boulder Creek Sheriff Center. WONDER WHAT MORE IS ON THE HORIZON? MONTEREY BAY ECONOMIC PARTNERSHIPS WILL SHAPE MORE PUBLIC POLICY. It is this private/public group that shaped the near-verbatim Zoning Code changes for the Planning Department and eventual approval by County Supervisors. These bankers and developers are busily crafting what they want our area to become without the benefit of public input. If you have a spare $150, you can attend the Monterey Bay Economic Partnership 4th Annual “State of the Region” event this Friday, November 30 in Seaside. Take a look. Notice that Supervisor Zach Friend is on the Broadband Roundtable Discussion Panel in the afternoon. That’s interesting he is leading the way to push such service regionally and seems a conflict of interest since he is a paid board member of Yardarm Technologies, a gun technology company that depends on complete wireless coverage in the County for its use. This technology was tested extensively, free of charge, for Yardarm by Santa Cruz County Sheriff Dept. deputies. Last Tuesday, the Soquel Creek Water District Board met at the Community Foundation Building to discuss critical Water Demand Offset Policy that will allow developers quicker approval for new service hook-ups without any real measurable water conservation to offset the increased water use by new development. The big push now by staff and a very complacent Board is to find ways to fund the $95 – $135 Million Project to inject three million gallons of treated sewage water into the area’s drinking water supply and add an estimated $2.5 Million to annual operating costs with unknown but potentially significant health problems for the general public. The District instituted a Water Demand Offset requirement in 2003 to address aquifer overdraft problems in the District and beyond. New customers had to replace toilets to reduce water use before being given a new service hook-up. Now, with changes approved by the Board, developers will be granted these hookups with a monetary payment only (no actual water conservation project) of $55,000 per Acre-foot new anticipated use, plus additional meter and service fees approaching tens of thousands of dollars. Lucrative for the District, the claim is that installing Smart Meters will save 86 Acre-Feet of water annually. That is an estimate, made to work on paper, but with no real measurable quantities backed up with actual data. Does this fulfill the District’s own requirement for a Water Demand Offset project? NO. The District was already planning to install Smart Meters over a year ago, and had set aside over $1 Million to do so, but staff zealously pointed out that this money could be instead used to fund PureWater Soquel Project and at the same time allocate large Water Demand Offset credits to developers to quickly pay their large hookup fees (there were about 46 of them waiting in line for conservation projects to actually save enough water to offset their new developments). Staff admitted that the District had already approved new service for 6AcreFeet more than what conservation projects had been accomplished to offset the increased pumping impacts. Review what caused the 2003 institution of the Water Demand Offset policy. Was it a result of legal action? Justify the $55,000/Acre-Feet Water Demand Offset charge to all applicants. Quantify and prove that Smart Meters (AMI) will save the required amount of water for development applications over a 20-year life, as specified in the District’s policy and show that installing Smart Meters was not a project previously considered for water conservation (also a requirement of the District’s policy). No Board member responded, other than Bruce Jaffe assuring me that my comments had been heard. Wow. And this District gets transparency awards of excellence??? Soquel Creek Water District staff and Board have lost touch with their ratepayers and seem focused on a resume-building ego trip that may lead to serious water supply quality and economic problems for the MidCounty area residents. WHAT IS 5G AND WHY HAVE MORE THAN 200 SCIENTISTS AND DOCTORS ASKED A FOR A MORATORIUM? As Verizon prepares to install more and more microcell towers in your public right-of-way without any environmental or biological consideration, you may wonder how this could affect the health and well-being of you and your family. Attend the free public event this Friday, November 30 at the Live Oak Grange on 17th Avenue. Well-known and respected doctors and scientists will speak to help educate the public about this technology heading our way. Last Tuesday, a long line of citizens testified before the County Board of Supervisors regarding problems with recent PG&E unauthorized tree removals on private property in the San Lorenzo Valley. Mr. Kevin Collins has filed a formal complaint with the Public Utilities Commission, citing that PG&E service interrupt safety technology is outdated and needs to be advanced to prevent further catastrophic fires in California, rather than drastic clear-cutting along fragile mountain roadways and riparian areas. He also cites CEQA violations. There will be a Pre-Hearing Conference before a Public Utilities Commission Administrative Law Judge to consider his complaint on Friday, November 30, 1:30pm in Santa Cruz. If you would like to attend to show the Judge there is public concern, please contact Kevin Collins for details. It is important that any who attend are respectful of the very structured court-like atmosphere that will be in session, and understand that public comment may or may not be accepted. The PG&E Base Camp in Scotts Valley has disbanded for now, but Davey Tree trucks, crews and chippers continue to show up on private property to intimidate property owners to acquiesce to allow removal of hundreds of trees, some being heritage trees. The County Counsel and Board of Supervisors continue to be silent and unresponsive to many property owners calling for an injunction. While PG&E should be required to obtain logging permits for the massive land areas now being clear-cut in the San Lorenzo Valley, their legal experts have side-stepped this issue by quietly filing for unprecedented 400′-wide easements on private property, without notifying the property owners. Contact all County Supervisors and demand they work with County Counsel to issue an injunction until proper CEQA process is fulfilled. This would force PG&E to fully evaluate all alternatives and consider less environmentally-destructive measures such as replacing transmission wire with “hardened” or insulated wire less prone to arcing with tree branch contact, and to install modern, more responsive circuit fuse technology that immediately de-energizes lines when there is a problem. Read about what San Diego Gas & Electric is doing to invest $3 Million in new technology to improve fire safety. Local San Lorenzo Valley activists, led by Mr. Kevin Collins, are not the only citizens demanding action from elected leaders. I live in rural Aptos and just last week received a letter from PG&E that they will soon be evaluating my mountain neighborhood for tree removal. We all need to contact our County Supervisors TODAY and demand an injunction, with hardened transmission wires and modern fuse technology installed instead of clear-cutting along fragile roadways. Call 454-2200. 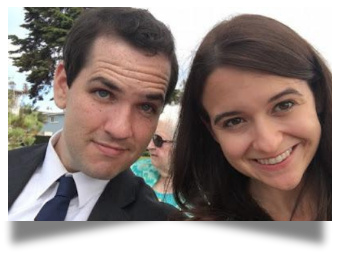 On Thanksgiving Day, I got an email letter from Ezra Levin and Leah Greenberg. They are pictured to the right. Their letter is reproduced at the end of this blog posting. Levin and Greenberg are the Co-Directors of Indivisible, a group seeking to “remake our democracy.” Indivisible was formed in reaction to the election of President Donald J. Trump in 2016. I got to meet Leah and Ezra at a small fundraiser in Menlo Park, and was impressed. There is a very active Santa Cruz Indivisible group, one of thousands across the country. I am supporter of the Indivisible effort, and I certainly encourage others to join up and to contribute. I thought about the Pledge of Allegiance. I had an idea. I tried saying it out loud: “Indivisible.” It gave us both goosebumps. One Nation, Indivisible. It was more than a word — it was a promise. Because in this moment, with Trump poised to take power, when our democracy and our neighbors would be under attack, we would need to fight together, indivisible. That was the only way we’d make it through. The fact is, our greatest political problem is that we all too often see ourselves only as “individuals,” omitting to note that we are not only individuals. We are “in this together.” It is only when we practice a politics that is premised on that truth that we will be able to realize our deepest aspirations, and to protect ourselves from the many dangers that threaten our future. This time two years ago, Ezra and I were in Austin for Thanksgiving, sitting at the kitchen table at his dad’s house. We were still reeling from the election of Donald Trump, and looking for something — anything — that we could do to respond. The night before, we’d met up with a friend who told us about a Facebook resistance group she was managing and how they weren’t sure what to do to have an impact. We knew exactly how grassroots activists could have an impact — as former congressional staffers in the early Obama years, we’d seen the Tea Party organize a powerful resistance that nearly brought Congress to a halt. 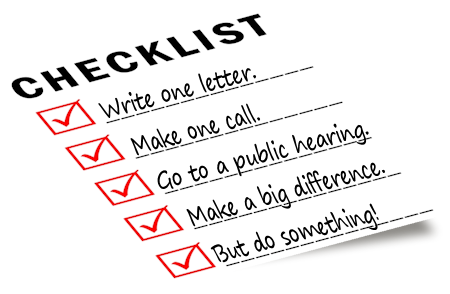 What if we took the lessons we’d learned from that era, reverse-engineered them, and wrote a simple guide to making Congress listen? And then we could just put it out into the world, so that any new activists who were getting organized could read it. Maybe a few folks would put it to good use. As soon as we came up with the idea, we were obsessed. We started an outline that night and started drafting the guide the next morning. Ezra’s family kept trying to get us to leave our laptops and hang out — it was Thanksgiving! — but the project just consumed us. It was the only thing we wanted to do. That day, we decided this guide needed a name. The Tea Party had had a name rooted in American history, one that captured the imagination. What was something comparable for us, something rooted in our values and our history? It gave us both goosebumps. One Nation, Indivisible. It was more than a word — it was a promise. Because in this moment, with Trump poised to take power, when our democracy and our neighbors would be under attack, we would need to fight together, indivisible. That was the only way we’d make it through. A couple weeks later, Ezra tweeted out a link to the Google Doc: “Indivisible: A Practical Guide to Resisting the Trump Agenda.” Within an hour, the traffic on the doc was causing it to crash. And that very night, we started getting emails from folks all over the country who were angry and scared and organizing. People who would pick up the charge, start leading this movement, and help change the course of American history. People who would soon start calling the groups that they had formed “Indivisible” groups. Yes, the Trump administration has been as damaging and cruel as we could possibly have imagined. But in response to something so incredibly evil, and dark, and corrupt, Indivisibles have responded with love, light, and determination. This Thanksgiving, we’ve got so much to be thankful for. Two years in, we’re not just resisting hate, corruption and authoritarianism — we’re insisting on a better future for all of us. Two years in, we have this hope for the future thanks to this incredible family of Indivisibles across the country who are making that hope possible. Thank you for banding together, indivisible, with us. EAGAN’S SUBCONSCIOUS COMICS. Love and Lust and subtle rage take the stage this week. See below a few pages. EAGAN’S DEEP COVER. See Eagan’s ” U.S. Prime ” down a few pages. 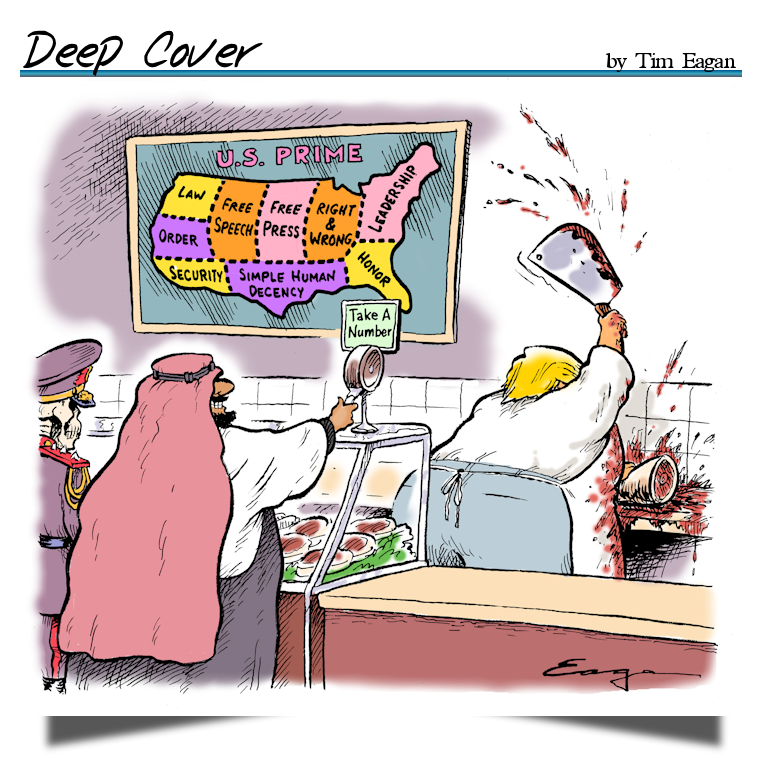 As always, at TimEagan.com you will find his most recent Deep Cover, the latest installment from the archives of Subconscious Comics, and the ever entertaining Eaganblog. MARK WAINER PHOTOGRAPHIC ART SHOW. We have a rare chance to see some absolutely beautiful photography from Dr. Mark Wainer at the R. Blitzer gallery from December 7-through the 29th. The Gallery is in the old Wrigley Factory, which is technically at 2801 Mission Street. I’ve known Mark for years and have watched and marveled at the stunning changes in his work. See for yourselves atMarkWainer.com there aren’t many ways to describe what Mark captures in his photos. The Opening Reception is on First Friday December 7, 5-9 pm. Trust me it’s a rare chance!!! LISA JENSEN LINKS. Lisa says she’s as busy as all get out…and will get something out next week! In the meantime go to Lisa Jensen Online Express (http://ljo-express.blogspot.com ). Lisa has been writing film reviews and columns for Good Times since 1975. UNIVERSAL GRAPEVINE. Each and every Tuesday from 7:00-8:00 p.m. 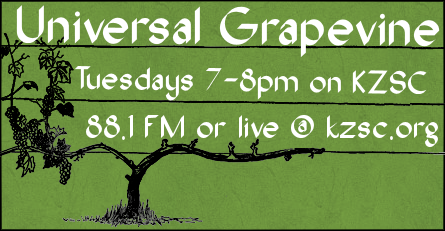 I host Universal Grapevine on KZSC 88.1 fm. or on your computer, (live only or archived for two weeks… (See next paragraph) and go to WWW.KZSC.ORG. Bookshop Santa Cruz’s traditional night featuring the top three winners of their Young Writers Contest in each age group. It’ll happen for the full hour on Nov. 27. Tandy Beal talks about her special performances on Dec. 4th. Then Carla Brennan shares news about her Insight Meditation workshops. December 11th has former mayor and political consultant Bruce Van Allen talking about that last election. “Then the Grinch thought of something he hadn’t before! What if Christmas, he thought, doesn’t come from a store. What if Christmas…perhaps…means a little bit more!” Dr. Seuss, How the Grinch Stole Christmas!